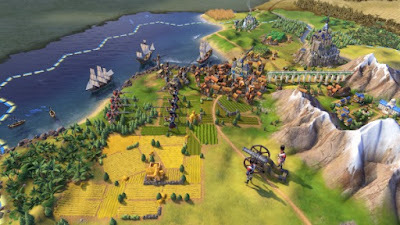 In Civilization VI (Civ 6), each district has its own function and some of them are even more effective through the benefits of individual civilizations. Through the land and other structures, the districts in Civ 6 can receive bonuses. Therefore, it is important to choose the location well before each construction. In our guide to Civ 6 we list the different districts and give you a small overview of the trade revenues, placements, bonuses and properties. The Holy Place gives you 1 point to great prophets, which makes them especially important at the beginning of a game. Adjacent miracles lend 2 beliefs, and when you place this district near mountains you will additionally receive faith for each mountain terrain (snow, grassland, plain, desert, tundra) 1. Every second forest or district field also gives you 1 faith. In general, through the Holy Place, you gain faith for every citizen. Your trade will bring you 1 domestic food and abroad 1 faith. Through the district, these buildings are unlocked: Cathedral, Gurdwara, Assembly House, Mosque, Pagoda, Shrine, Stave Church, Synagogue and Wat. The campus is available to all civilizations alike. Through it, you get Pro Round 1 point for great scientists and 2 science for every citizen of your city. The trade revenues of the campus are 1 food inland and 1 science abroad. The neighborhood bonus you get through mountains, so all terrain on a mountain with grassland, plain, desert, tundra or snow. In addition, there is a bonus for every 2nd rain-forest field and every 2nd district terrain field. The campus district can have library, Madrasa, research lab and university. With this district you can secure additional living space. It is very important that you pay attention to the quality of the land on which the aqueduct is to be built. There may be differences of 4 units of living space. Cities without fresh water sources receive up to 6 living rooms. If there is fresh water there may even be only 2 living areas. This district must be built next to the city center and an oasis, a lake or a mountain. As a Roman you can build baths, which in each case ensures you 2 living areas and 1 amenity. You get the airfield quite late in the course of the game and it offers you an aircraft capacity of four aircraft. This district cannot be placed on a hill or mountain, and you can also use it to build an airport and hangar in the district. A port will allow you to eliminate the cost of moving and disembarking (arriving and departing) across this port and gaining 1 trafficking capacity. In addition, 1 point is generated on the next large admiral. You get neighborhood bonuses through adjacent coastal resources and every second district. Per citizen you receive 2 gold and 1 science. Your trade benefits from the port and you get 3 gold for foreign targets. You can only build the port on a coastal field and get through it the buildings: lighthouse, shipyard and seaport. With England the port is replaced by the Royal Navy Dockyard. This gives you, in addition to the normal bonuses of the port 1 point on a large admiral, 1 trade route capacity, 1 move points for units built in the port and 2 gold when the port is built on a foreign continent. With the Commercial Hub, you get 1 point on large traders and 1 gold for adjoining districts. Furthermore, each river or port lends 2 gold. The trade is improved in Germany with 1 production and abroad with 3 gold. Switch freely: bank, market and stock market. Russia replaces the Holy Place with its own Lavra. Through this you can get a terrain field extension for each consumed Great Personality. In addition, you get an additional point for Great Prophets, and 1 more on great writers and musicians. An additional neighborhood bonus is also granted to you as nature miracles generate faith with the Lavra 2. Through the district of the Industrial Zone, you gets 1 point for large engineers. Every mine, every quarry, and every other district, you also get 1 production through the Neighborhood Bonus. Furthermore, every citizen of the city produces 2 production and receives 1 production in domestic and foreign trade. Within the district you can build the workshop, factory, electronics factory and the power station. If you play with Germany, you can build the Hanseatic League. This gives you additional 2 production for each Commercial Hub and 1 production by each adjacent resource. The Encampment is a military district, which gives you 1 point on great generals. An innovation in Civ 6 is that this district can attack enemies. Your citizens gain culture and production through a camp 1 and you also receive 1 production for both trade routes. This district is not to be built next to the city center and its own buildings (armory, barracks, stables and military academy) give you additional living space. You cannot build the spaceport on hills and mountains, and it is a basic prerequisite for the science victory, since it clears the earth saddle start, the start of the moon landing and the Mars colony. Placement: not on hills. The city center is the center of your cities. It offers you advantages in connection with other districts and 1 food for trade in domestic and 3 gold for foreign trade. Through the town center you can build city walls, grain stores, monuments, water mills and sewers. The theater square district is important for tourism and produces 1 great artist, musician and writer. Furthermore, for each citizen you get 2 culture and 1 food in the domestic trade and 1 culture in the foreign trade. Placed the theater on hills (with grassland, plain, snow, tundra and desert) and you turn off the buildings film studio, amphitheater, broadcasting center, art and archeology museum. The two peoples of Greece (also Sparta) receive additional bonuses through an adjacent city center. With the entertainment complex you can increase the satisfaction of your citizens by 1 amenities. Through both forms of trade you get 1 food and you can unlock the arena, the stadium and the zoo in the district. Brazil is replacing this district with its own street carnival, which offers two amenities. In addition, you can unlock the carnival project and get another convenience while it is being produced. If you close the project, you will get several great personalities. The Neighborhood area is only available in the later game. The district can be built only after researching urbanization. Depending on the terrain, you will get a different amount of living space. For breathtaking fields, there are 6 living rooms, for charming 5, for average 4, for unattractive 3 and for repulsion 2 living space. The Congo can already erect a M'banza very early, which can however only be established on forest or rainforest fields. You get 5 living space, 2 food and 4 gold.